I’m not sure if I can remember the last time a new truck launch has given us so much fun. 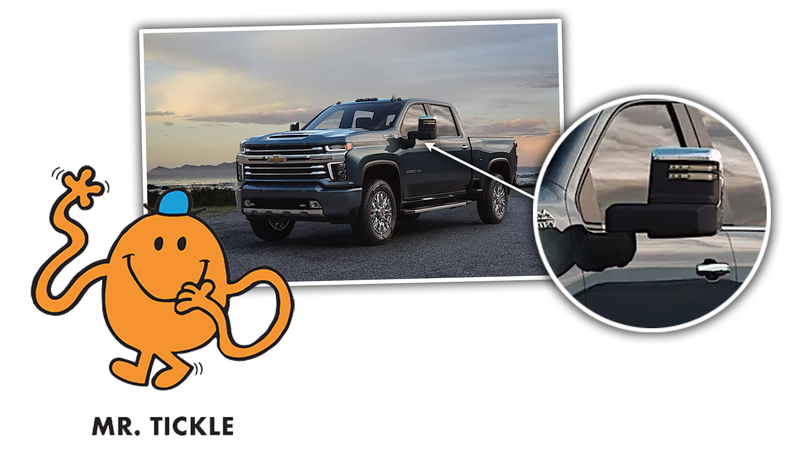 The 2020 Chevy Silverado HD has done it, though, with that perfect combination of baffling design and unhinged bravado. We thought the High Country edition would be a bit better, and I suppose it was. Until I looked at the mirrors, and immediately thought of Mr.Tickle, noted kid’s book, um, orb with wiggly arms. Look at those zig-zaggy, wiggly-looking mirror arms. I mean, I understand there’s a hinge there, and it has a purpose, but is there any way to not look at that and see some rubbery arms, looking like they were yanked off some 1920s cartoon character? This thing just gives and gives and gives.